Two-thirds of the way through the season, and the Championship promotion race continues to be too close to call. At one stage, Leeds and Norwich looked like runaway favourites to go up, but they’ve been reeled back in by the sides below them. Now going up is make or break for those two, who might not get another opportunity this good. The table is finely balanced after another big weekend at the top. We’re looking over all of the contenders for promotion and reflecting on their latest results. Here’s our review of the latest Championship action and the battle for the Premier League. Sunday saw a clash between two sides who are in very different places right now. Struggling Ipswich prop up the table, and they travelled to promotion chasing Norwich in the East Anglian derby. These clashes have been tight in recent years, but this game was anything but. The Canaries were 3-0 winners, showing their class as they cruised back to the top of the table. It was a rowdy clash, with a touchline fracas seeing Ipswich manager Paul Lambert sent to the stands against his former side. The Scot is set to take Ipswich down this term, while his old club are bound for the Premier League. 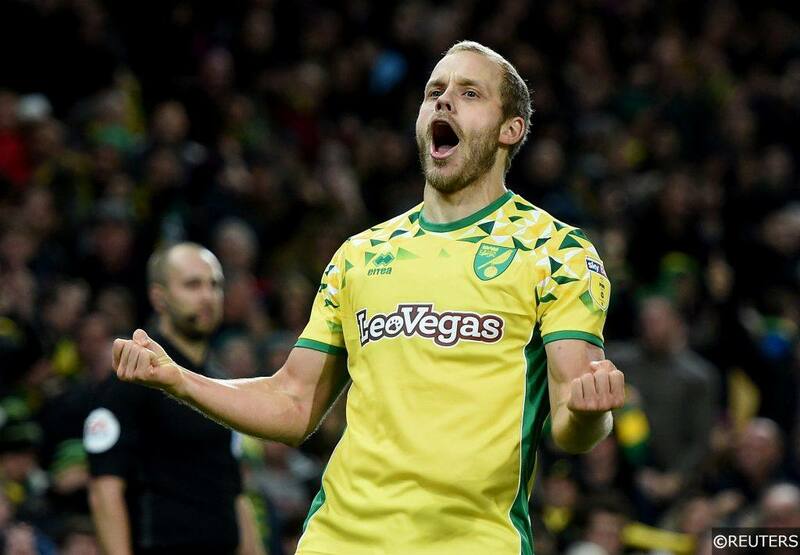 Teemu Pukki made the difference for the Canaries, scoring twice in the rout. He remains in the running to top the scoring charts, after putting one of the league’s worst defences to the sword. He’s added a bit of class up front, which helped Norwich leap back into first place in the Championship. That has put the pressure back onto Leeds ahead of the upcoming midweek round of fixtures. Leeds United had previously edged out in front, after they claimed a point on Saturday. Their weekend clash with a tricky visit to playoff hopefuls Middlesbrough, a side who aren’t too far behind in the race for the top two. They pressed their case for automatic promotion in this one, troubling Leeds with a series of chances. Middlesbrough dominated the opening half, but they had to wait until two minutes into the second before breaking the deadlock. A wonderful effort from Lewis Wing put them in front. However, that seemed to awaken Leeds. Middlesbrough held back – in typical Tony Pulis style – and it cost them. The equaliser came in the 101st minute, putting Leeds top of the pile. Given the circumstances, it looked like a good point. However, they head into Wednesday’s clash with Swansea knowing that they sit two points shy at the top now. It’s a point we’ve been making all season, but you do have to wonder if Marcelo Bielsa’s demands are too much for a Championship side. Leeds showed the ability to play like the Argentine wanted in the earlier stages of the campaign. As the season has gone on, his high intensity style seems to be hampering their promotion hopes. The Championship weekend kicked off with a thriller, as Sheffield United drew 3-3 at Aston Villa. The two sides are each hoping for a return to the Premier League. Third placed United are hoping to edge into second, while 10th placed Villa want to go one better than last season’s play-off final defeat. In this clash, was the Blades who made the sharpest start. Billy Sharp scored a hat-trick in their visit to Villa Park, putting the Blades 3-0 up with just over an hour gone. That was a message to the sides around them, as the Blades showed Leeds and Norwich what they could do. With 10 minutes to go, a 3-0 lead should have given them three points. However, Villa sparked a fightback, scoring what seemed like a consolation in the 82nd minute. They were able to claw their way back to 3-3, with Andre Green levelling in added time. In the end, it was a thriller which did very little for either side’s ambitions. There was a less intense, but more effective statement made by West Brom on Saturday. They claimed a narrow 1-0 win at fellow relegated side Stoke, which left them five points shy of Leeds with a game in hand. Darren Moore’s side are now out of the cup and focused on promotion, a bid they’re aiming to continue in Tuesday’s live Sky clash with Nottingham Forest. Bristol City kept their reputation as the form team in the Championship, winning for the eighth game in a row. They were 1-0 victors at Blackburn, with Eros Pisano bagging the winner that kept them inside the top six. It was a clash game with plenty of chances, eventually decided by a set-piece. While it wasn’t the weekend’s most open encounter, it was a big result for the league. We’ve seen the same top six largely all season. Norwich and Leeds at the top, Sheffield United, West Brom and Middlesbrough following. Derby went relatively unchallenged, until now. The Robins are in fine form, and they’re aiming to make sixth their own in the coming weeks. We see them picking up yet another win this week, as they push for a Premier League place. Derby continued to push for sixth themselves on Saturday. They saw off Hull 2-0, despite facing a few hairy moments at the back. They had Martin Waghorn to thank for the victory, as he scored both goals for Frank Lampard’s side as the Rams stayed level on points with Bristol City. They’re outside of the top six by just two goals, but they have another 16 games to force their way back in. Categories: Blog, Football, and The Championship. Tags: championship, championship competition, Championship football, Championship promotion, Championship promotion race, championship review, championship season, championship winners, and English Championship. Team Tag: aston villa, birmingham, Blackburn Rovers, bolton, brentford, bristol city, Derby County, Hull City, Ipswich, leeds, Middlesbrough, norwich, Nottingham forest, preston, QPR, reading, rotherham, sheffield united, sheffield wednesday, stoke, Swansea City, west brom, and Wigan. League: England Championship. Sports: Football.